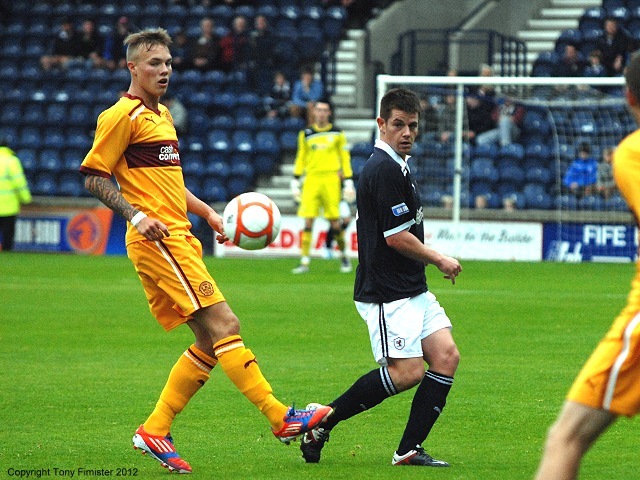 Raith’s encouraging pre-season form continued tonight with a deserved one all draw against Motherwell at Stark’s Park. Both teams made changes from their respective weekend defeats. Laidlaw started in goals in place of McGurn while Malone came back into the left back position. Stuart Anderson made his first start alongside Alan Walker in the middle of the park while trialist Greig Spence started up front with Brian Graham. While Stuart McCall had promised changes after his sides 4 0 defeat from Ayr and with a game lined up against Arbroath tomorrow he chose only to make three. Watt, Hetherington and Erwin coming in for Hateley, Law and Humphrey. Both teams seemed comfortable in possession early on and were knocking the ball around well without creating too many problems for either defence. The first attempt came after 5 minutes. 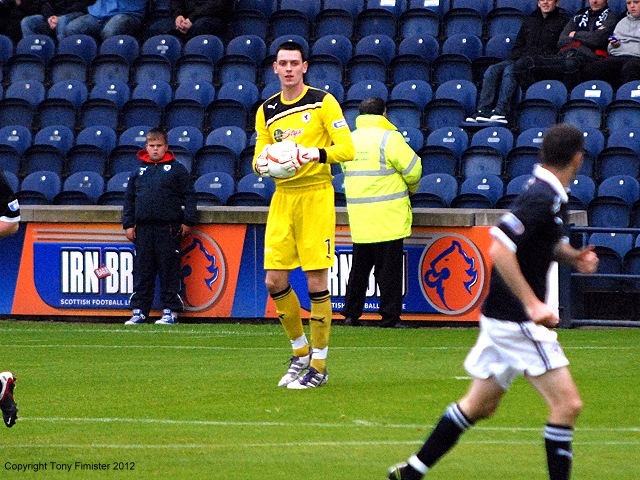 A 22 yard drive from Jonathon Page was well held by young Raith keeper Ross Laidlaw. 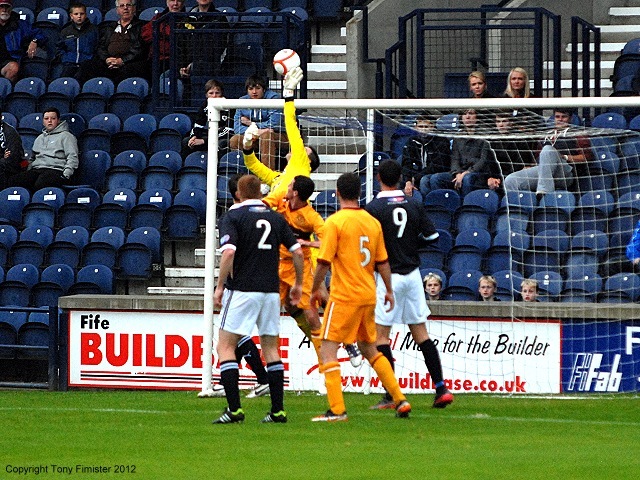 Raith’s first effort came 2 minutes later. A quick break saw Spence brought down just outside the Motherwell penalty area. From the resulting free kick Graham’s driven effort had to be tipped over by Randolph. 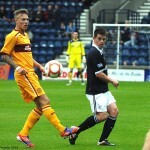 While the home team were stroking the ball around well they were doing so without causing Motherwell too much trouble. As a result it was the Lanarksgire side who were looking the more likely to score and they carved out several chances in a matter of minutes. Murphy was the first to try his luck on 15 minutes, working some space inside the area he saw his angled shot blocked by a great sliding challenge from Malone. A few minutes later the lively looking Hetherington sent in a back post ball to Watt who should have done better with his chance from point blank range. His downward header however allowed Laidlaw to scramble across and palm it away. 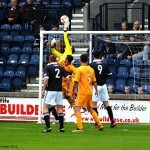 Hetherington again caused trouble down Raith’s right hand side a few minutes later. Cutting inside his shot looked goal bound but was headed over by player manager Murray. From the corner Higdon’s header was on target but lacked power. Raith were struggling to get a foot hold in the game but on 20 minutes good work from Alan Walker freed up Spence but as he approached the box he elected to tee up Walker when shooting seemed the better option and the chance was gone. On 35 minutes the came the best piece of football up to that point. Jamie Murphy was given too much space down the left hand side, allowing him to whip a great ball into the box that Lee Erwin managed to side foot towards goal from 6 yards out, only a smart save from Laidlaw low down using his legs kept the scores deadlocked. Two minutes later Motherwell came even closer. Receiving the ball 22 yards from goal Higdon’s first time effort was deflected off a Raith leg, wrong footing Laidlaw who could only watch as seemingly in slow motion, the ball spins away from goal and onto the post. 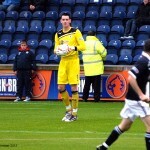 The second half immediately started more positively for Raith. After 50 minutes some great play from Thomson saw him nutmegging the defender and sending the ball to the back post to his opposite full back Malone, the ex-Ayr man was unable to bring the ball under control though and the chance went begging. That piece of play was a sign of things to come though and while Spence and Graham struggled to strike up a partnership up front the rest of the players were showing an eagerness to get forward that has sometimes been lacking in previous seasons. Stuart Anderson was tidy in possession and was allowing Walker to get forward. Good play by both of them saw the ball being fed to Grant Anderson but his cross just evaded Walker who had continued his run into the box. On 55 minutes Raith put together their best move of the match. Hamill played the ball to Walker who’s backheel allowed Graham to cross the ball into Grant Anderson but the header was deflected wide for a corner. Both sides made double substitutions after 63 minutes. For Motherwell Erwin and Watt were replaced by Moore and Murray while for Rovers Stuart Anderson and Greig Spence went off for Ross Callachan and Pat Clarke. The subs seemed to slightly knock Raith out their stride and after a spell of possession Motherwell took the lead. A corner from the Pratt Street end wasn’t cleared properly and as Laidlaw failed to get any distance at all on his punch the ball bounces around the area, eventually falling to Murphy who poked it home from almost under the cross bar. Despite going a goal down Raith responded well and almost replied immediately. A flick on from Graham teed up Clarke who took one stride before sending a half volley towards goal that Randolph did well to keep out, diving sharply to his right. As the ball was played back into the box Clarke was again the recipient, sending his header just past the right hand post. Raith’s third sub was made on 71 minutes, Laurie Ellis replacing Grant Murray. Raith really started to apply the pressure in the closing stages and despite the fact they were playing against Champions League hopefuls it was Raith who looked the fitter team. A free kick from Walker out on the left hand side was drilled in and after it skidded off 2 defenders heads Graham guided it just over from 5 yards out when it may actually have been curling in. 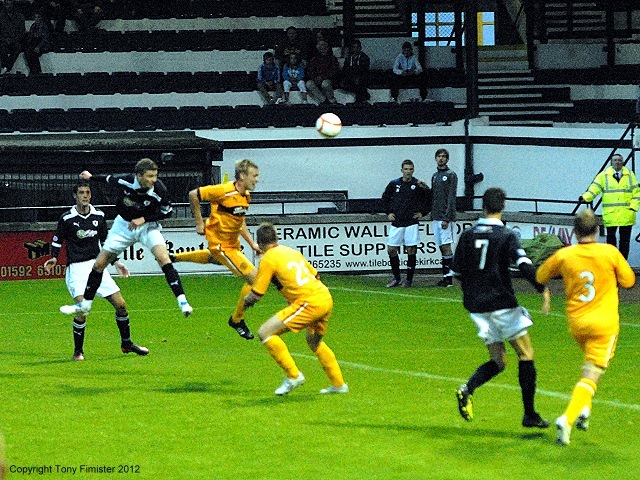 A minute later a Grant Anderson cross was deflected over his own bar by Jonathon Page. From the corner the ball fell kindly to Hill who’s shot was blocked but only as far as Graham who seemed certain to score but his ferocious drive ricocheted off Randolph despite him not knowing too much about it. Raith made their final sub on 86 minutes. Reece Donaldson replacing Eddie Malone. 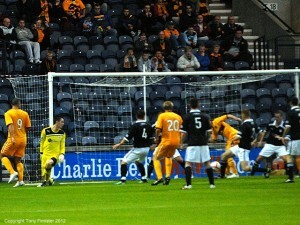 A minute later Raith got the equaliser their play merited. Jason Thomson, who had got forward whenever possible again made a forward run and swung a great ball into the box that allowed Pat Clarke to guide a powerful swerving header past Darren Randolph into the top left hand corner of the net. Buoyed by the equaliser Raith almost grabbed a winner with virtually the last kick of the ball. Walker got to the bye line and cut the ball back, as the Motherwell defender stumbled the ball ran to Clarke who from 12 yards out should have done better. Despite controlling it, composing himself and picking his spot, his shot rattled the cross bar when he really should have put it away. While Raith were unlucky not to win it at the death Grant Murray will be satisfied that his new charges did more than enough to warrant a a second draw against SPL opponents. While the team played well throughout they only really provided a real goal threat once Pat Clarke was introduced. The midfield played the ball around well and are inclined to get forward, Grant Anderson and Allan Walker in particular. The back four were well organised and again both full backs got forward whenever possible, and while Ross Laidlaw may be disappointed with the goal he was arguably Raith’s best player in the first half. Murray and his team certainly have something to build on for the season ahead. Patient build up by raith. Graham shoots just wide. Josh watt wriggles free in the box but is blocked by a great Malone challenge. Motherwell have space on the left. Ball crossed in and Josh watt pulls a save from laidlaw. From corner higdon heads goalwards. Laidlaw tips over the bar. Josh watt shoots from way out. Flies wide! Lasley free kick. Headed clear by hill. Graham through on goal. Brought down by suanders. Free kick. No card. 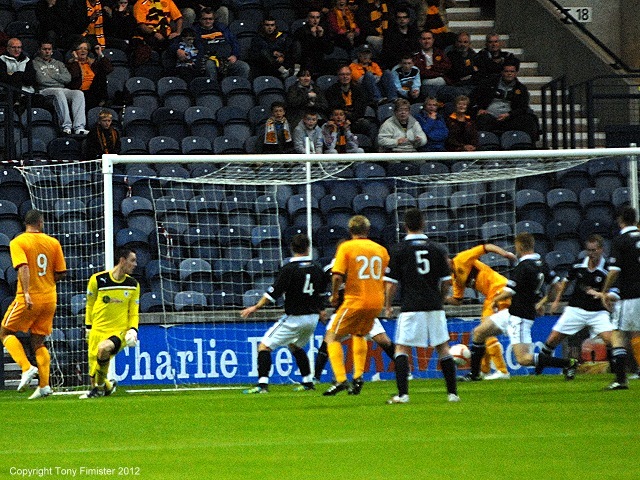 Free kick Motherwell. Easy stop for laidlaw. 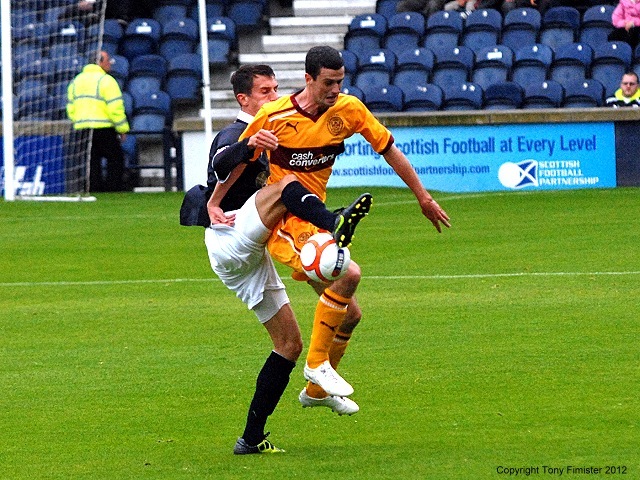 Motherwell whip the ball in the box. Higdon from six yards. Saved by laidlaw! Higdon from twenty yards. Deflection wrong foots laidlaw but it hits the post. Half time and rovers more than holding their own against SPL opposition. Teams back on the field. Rovers to kick off. Great skill by Thomson down the right. Delivers the cross but Malone unable to convert at the back post. Raith rovers pressing but can't find a way through the well defence. Great football by raith. Ball played in for Anderson. Header deflected wide. Suanders with an other heavy challenge. Trialist the recipient. Raith looking the stronger of the two sides. It's Motherwell who take the lead there as the ball comes in higdon gets up knocks the ballro the back post where Moore stabbed home. Pat Clarke on the half volley pulls a save from Randolph. Ball swung back in but Graham unable to steer his header past the well keeper. 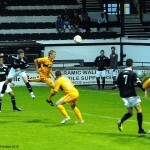 Grant Anderson breaks free on the right but unable to find a team mate with the cross. Malone makes a great run but the flag is up. Raith still on the hunt for a goal. Free kick on the corner of the box. Walker fizzes it goalwards. Graham glances it just over the bar. Anderson breaks right. And draws a corner. Ball drops to hill. Shot deflected. Falls to Graham blocked on the line. Walker blazes over. Pat Clarke!!! Thomson down the right swings it in. Pat Clarke thunders a header past Randolph. Raith pushing for a winner! 898 people have been treated to some nice football tonight. Pat Clarke rattles the bar!! Another chance for Clarke but he's pulled it wide. Full time. Good performance by rovers. The players leave the field to a well deserved round of applause.